Hello fellow comic junkies! This week the book club brings one of last years brightest to the table! The VISION! 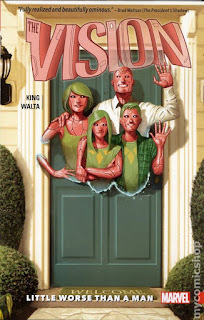 After doing some research and looking into what books these days are labeled as "good" to "better", and "best", I was recommended this series by Tom King and Gabriel Hernandez Walta called The Vision. Highly recommended from Dave at Dr. Volt's comics connection (our new sponsor Yay! ), he says the book just keeps coming back up and selling. As much as I love the classics, I think it's wise to balance our book club of what's currently considered a "great read" so we can parallel the influential origins and compare thoughts on why or why not. Our opinions on Vision may bring a bunch of facts to light as well about the character, etc. . . This story arc is 12 issues long so you'll need TPB 1 and 2 to complete the reading.